Take a moment and think about the weather today where you are. Is it normal or typical? Is it what you’d expect? If it’s been cool the past few days but the temperature is climbing today, is that weather or climate? Are weather and climate the same thing? Though they are closely related, weather and climate aren’t the same thing. Climate is what you expect. Weather is what actually happens. More specifically, weather is the mix of events that happen each day in our atmosphere. Even though there’s only one atmosphere on Earth, the weather isn’t the same all around the world. Weather is different in different parts of the world and changes over minutes, hours, days, and weeks. Most weather happens in the part of Earth’s atmosphere that is closest to the ground—called the troposphere. And, there are many different factors that can change the atmosphere in a certain area like air pressure, temperature, humidity, wind speed and direction, and lots of other things. Together, they determine what the weather is like at a given time and location. Whereas weather refers to short-term changes in the atmosphere, climate describes what the weather is like over a long period of time in a specific area. Different regions can have different climates. To describe the climate of a place, we might say what the temperatures are like during different seasons, how windy it usually is, or how much rain or snow typically falls. When scientists talk about climate, they're often looking at averages of precipitation, temperature, humidity, sunshine, wind, and other measures of weather that occur over a long period in a particular place. In some instances, they might look at these averages over 30 years. And, we refer to these three-decade averages of weather observations as Climate Normals. Looking at Climate Normals can help us describe whether the summers are hot and humid and whether the winters are cold and snowy at a particular place. They can also tell us when we might expect the warmest day of the year or the coldest day of the year at that location. But, while descriptions of an area’s climate provide a sense of what to expect, they don't provide any specific details about what the weather will be on any given day. Here’s one way to visualize it. Weather tells you what to wear each day. 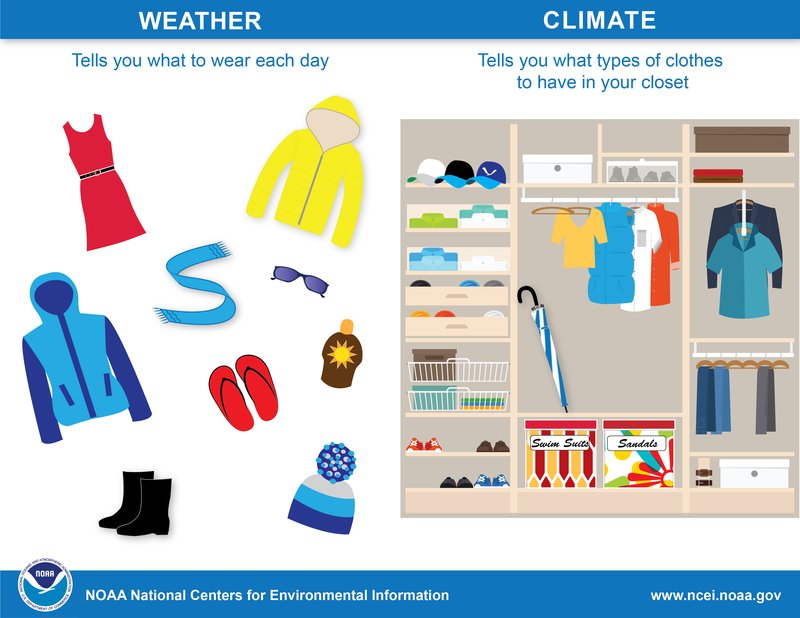 Climate tells you what types of clothes to have in your closet. Across the globe, observers and automated stations measure weather conditions at thousands of locations every day of the year. Some observations are made hourly, others just once a day. Over time, these weather observations allow us to quantify long-term average conditions, which provide insight into an area’s climate. In many locations around the United States, systematic weather records have been kept for over 140 years. With these long-term records, we can detect patterns and trends. And, as the Nation’s official archive for environmental data, it’s our job to collect, quality control, and organize these data and make them available online for scientists, decision makers, and you. Are regional climates different from the global climate? Like the United States, different regions of the world have varying climates. But, we can also describe the climate of an entire planet—referred to as the global climate. Global climate is a description of the climate of a planet as a whole, with all the regional differences averaged. Overall, global climate depends on the amount of energy received by the sun and the amount of energy that is trapped in the system. And, these amounts are different for different planets. Scientists who study Earth’s climate look at the factors that affect our planet as a whole. How does the climate change? While the weather can change in just a few minutes or hours, climate changes over longer time frames. Climate events, like El Niño, happen over several years, with larger fluctuations happening over decades. And, even larger climate changes happen over hundreds and thousands of years. Today, climates are changing. Our Earth is warming more quickly than it has in the past according to the research of scientists. Hot summer days may be quite typical of climates in many regions of the world, but warming is causing Earth's average global temperature to increase. 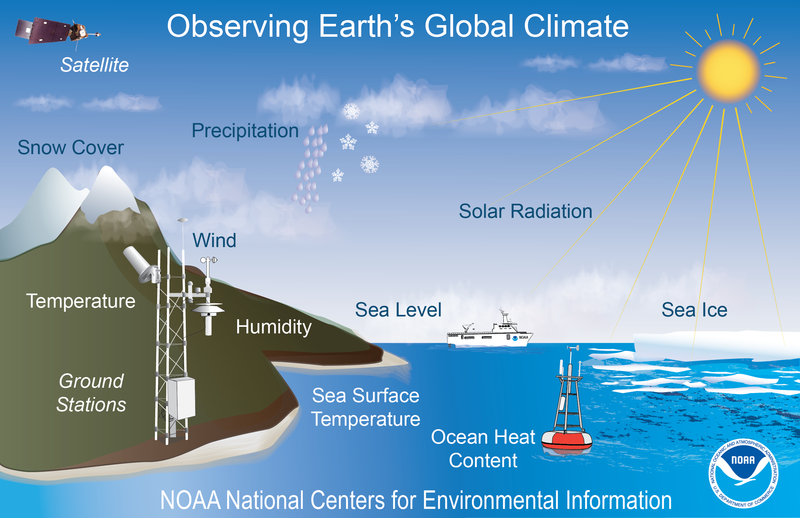 The amount of solar radiation, the chemistry of the atmosphere, clouds, and the biosphere all affect Earth's climate. As global climate changes, weather patterns are changing as well. While it’s impossible to say whether a particular day’s weather was affected by climate change, it is possible to predict how patterns might change. For example, scientists predict more extreme weather events as Earth’s climate warms. Why do we study climate? Climate, climate change, and their impacts on weather events affect people all around the world. Rising global temperatures are expected to further raise sea levels and change precipitation patterns and other local climate conditions. Changing regional climates could alter forests, crop yields, and water supplies. They could also affect human health, animals, and many types of ecosystems. Deserts may expand into existing rangelands, and features of some of our National Parks and National Forests may be permanently altered. NCEI’s environmental data provide critical information for retailers, manufacturers, and the companies that invest in them. Though climate and weather are closely related, they aren't the same thing. The main difference between the two is time.